See sample pages (PDF format, 1.4Mb). Whether we live in cities, in the suburbs, or in the country, birds are ubiquitous features of daily life, so much so that we often take them for granted. But even the casual observer is aware that birds don’t fill our skies in the number they once did. That awareness has spawned conservation action that has led to notable successes, including the recovery of some of the nation’s most emblematic species, such as the Bald Eagle, Brown Pelican, Whooping Crane, and Peregrine Falcon. Despite this, a third of all American bird species are in trouble—in many cases, they’re in imminent danger of extinction. 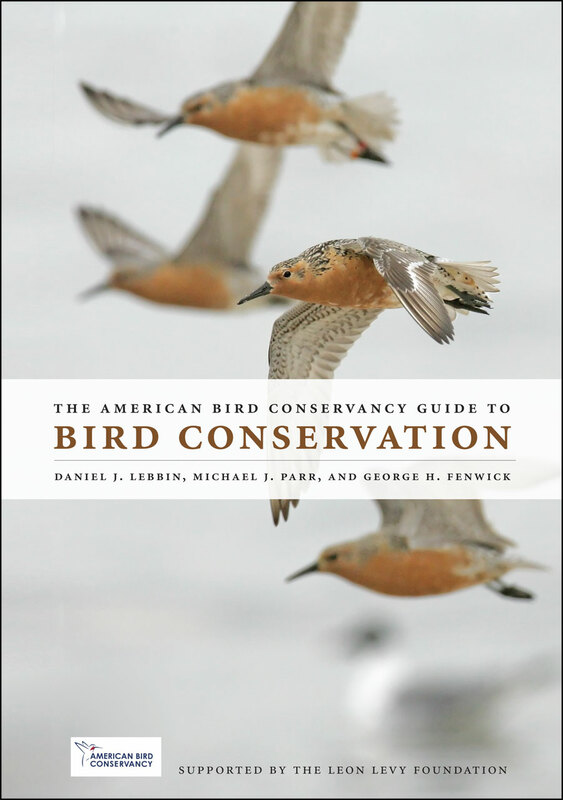 The most authoritative account ever published of the threats these species face, The American Bird Conservancy Guide to Bird Conservation will be the definitive book on the subject. The Guide presents for the first time anywhere a classification system and threat analysis for bird habitats in the United States, the most thorough and scientifically credible assessment of threats to birds published to date, as well as a new list of birds of conservation concern. Filled with beautiful color illustrations and original range maps, the Guide is a timely, important, and inspiring reference for birders and anyone else interested in conserving North America’s avian fauna. But this book is far more than another shout of crisis. The Guide also lays out a concrete and achievable plan of long-term action to safeguard our country’s rich bird life. Ultimately, it is an argument for hope. Whether you spend your early weekend mornings crouched in silence with binoculars in hand, hoping to check another species off your list, or you’ve never given much thought to bird conservation, you’ll appreciate the visual power and intellectual scope of these pages. Eastern Forests "BCR: 13,23, 24, 28, 29, 30"
Southern Forests "BCR: 25, 26,27, 31"
Grasslands & Prairies "BCR: 11, 17, 18, 19, 21, 22, 37"
SC Arid Lands "BCR: 20, 35, 36"
SW Arid Lands "BCR: 9, 32, 33"
Marine "(Beaches, Coasts & Marine)"
"Hands down, this is the most important book of the year, one every birdwatcher should own. It provides distribution, threats, and conservation status for all 212 Watch List species in the United States. It describes the habitats all birds rely on—the authors have organized these into twelve beautiful ’birdscapes.’ . . . It analyzes the human causes of bird mortality. And most important, it lays out an achievable plan of action for safeguarding our country’s rich birdlife and how you can help."